A 42-year-old middle school teacher in Houston, Texas, was arrested last week for allegedly performing a seductive lap dance for a 15-year-old boy in front of a class two months ago, KHOU 11 reports. The teacher, Felicia Smith, 42, was charged with improper relationship with a student, according to a statement from the Aldine Independent School District. She appeared in court Friday morning. The incident, which was captured on video, occurred Feb. 26 at Stovall Middle School, according to Aldine Independent School District police. The student, who was celebrating his birthday, told authorities that Smith stopped him as he walked into his third-period class and ordered him to sit at his desk, the news station reports. After the tardy bell rang, she placed a chair in front of the room and turned on music as the other students began yelling for the boy to sit in that chair. Smith allegedly gave him a full contact lap dance, rotating her buttocks against him and rubbing her hands all over his body, the news station reports. "She also got on her knees in front of him and placed her head between his legs," the report says. 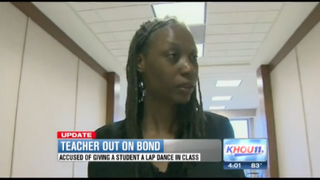 And the news station says that the student acknowledged slapping Ms. Smith on the buttocks a few times. During the finale, Smith reportedly wrapped her arms around the student and he squeezed her bottom, the report says. As she hugged him, Smith reportedly said, "I love you, baby. Happy birthday," according to documents. Investigators obtained a video recording of the performance, which lasted 3 minutes, 54 seconds, the report says. A copy of the video is reported to be on file at the Harris County district attorney’s office and another with the Aldine ISD Police Department. Read more at KHOU 11.